You can learn a great deal by studying the lives of famous artists. 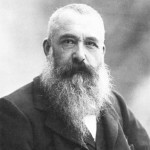 The French artist Claude Monet is one of the most famous artists of all time! 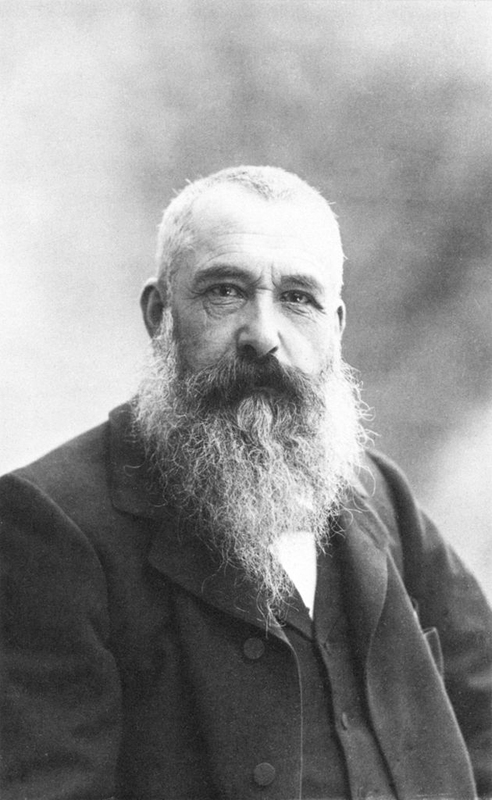 Let’s learn about Monet’s early career and study in-depth the new style of art he championed called Impressionism. Monet was born in the mid-1800s in France (1840-1926). 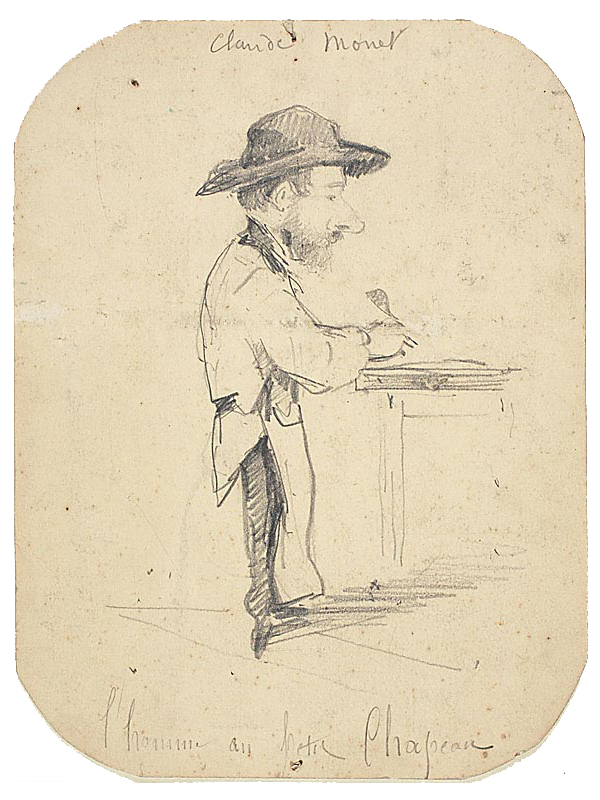 He wasn’t very interested in school but had a talent for caricature and as a teenager made a tidy profit selling his work. What is a caricature? A caricature is a portrait of a person that exaggerates his or her features to such a degree that they look funny and odd but are still recognizable. Sadly, Monet’s mother died when Monet was only seventeen. Adding to his loss, his father was against him becoming an artist. Perhaps it was Monet’s aunt, an amateur painter, who convinced Monet’s father to allow Monet to go to Paris to study art. From the beginning, Monet didn’t like the tame, official French academic art that was in style at the time. Instead, he interested himself in those artists who experimented with new styles and techniques. What exactly was the French academic art of the time, and how did Impressionism differ from it? In the years before Impressionism, an academic artist would make many preliminary sketches to finalize his or her composition. He would then make his final drawing on a piece of canvas. After this, he would apply paint to his canvas in three stages. Before we discuss these stages, can anyone tell me what paint is exactly? 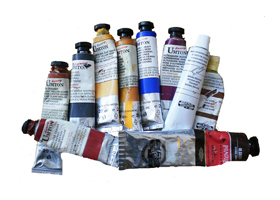 Paint is the combination of pigment and medium. Specifically, a pigment is a material such as a mineral or plant or animal by-product that is ground into a fine powder or paste and mixed with other glue-like materials called a medium to make paint or ink in different colors. For example, the pigment sepia, which is a dark reddish-brown color, is made from squid, while animal bones can be made into a glue-like medium. As we shall learn, French academic artists used an extra oil-based medium and traditional pigments to create transparent, thin, and fluid paint films called glazes. Let’s discuss how a French academic artist would apply paint to his canvas. First, he would apply the “sauce,” which was a monochromatic, reddish-brown paint over his entire canvas to establish his composition. Second, he would make an underpainting by using inexpensive pigments (ochres, cheap blues, black and white) to approximate realistic color. He would then dry his canvas and scrape it to remove any raised paint on the surface. There weren’t any details at this stage. Third, he would apply more expensive pigments suspended in oil (called glazes) to approximate realistic color. As an academic artist, he would exploit the transparency of the oil medium to produce certain effects. For example, he would painstakingly add one layer of color at a time, allowing each layer to dry before adding a new color on top. To create a surface free of visible strokes (impasto), he would apply varnish between each layer. By applying colors layer-by-layer and applying varnish between each layer, he would build up the details in his composition. When done, the colors would shine through each layer and would appear to combine and glow. In this way, he would bring the details to a smooth, high finish. As a final touch, he would add highlights in thicker, visible strokes to give his painting a sense of immediacy. It is important to realize that French academic artists were following a tradition that began in Italy in the 14th century with the Renaissance, which looked back to ancient classical art and emphasized proportion, perspective, and three-dimensional form. Indeed, for years it was considered a mark of genus for an artist to be able to convey three-dimensional form onto a flat surface. In general, how did academic artists achieve three-dimensional form in their paintings? Working in studios that had dark walls, they would model the figures in their works to look three-dimensional by changing the value of pigment from light to dark (by adding white or black). To aid in this process, they would set up their pallet with colors from light to dark. It is important to realize that many of the pigments academic artists used had been around for nearly five hundred years. The range of color was limited. In addition, some pigments were quite costly, while others could not be mixed together. These factors further limited the range of color available to academic artists. Second, academic artists gave their paintings many details but often showed very little visible brushstrokes. The paint was mostly smooth. The main goal of academic artists was to create clearly defined, three-dimensional forms and apply color to these forms. For many academic artists, color was an extension of drawing. Line and drawing were most important, while color was secondary. Finally, academic artists focused on the human figure. They liked to portray stories from ancient Greek and Roman mythology, history and the Bible and often modeled the figures in their works to resemble the sculpture of ancient Greek and Roman heroes, gods and goddesses. The Impressionists took a very different approach. Following in the footsteps of artists who came before them, they painted out-of-doors. The goal of Impressionists was to use oil paints in bright colors to show outdoor scenes in different atmospheric conditions. Often without mixing colors, they would apply pure color directly onto their canvases in short, broken strokes without any underdrawing or underpainting. Unlike academic artists who set up their pallet with colors from light to dark to model form, Impressionists set up their pallet with the prismatic colors of the rainbow to convey an impression of form as revealed against the ever-changing quality of light. First and foremost, they sought the true appearance of nature and tried to capture its essence. One thing they noticed about nature was that there was color—even in the darkest of shadows. Indeed, many Impressionists painted shadows with color. Another thing they noticed was the way the colors of one object would reflect across the surfaces of other objects nearby. Impressionists painted these reflections and dissolved line and built up form stroke-by-stroke via color. While earlier artists had noticed these same effects, only the Impressionists put all of these effects together. For the Impressionists, color became primary, while figures and landscapes became sketchy and fresh. The only story in Impressionism was the story of an immediate impression of color and light. How exactly did the Impressionists apply color to their canvas? 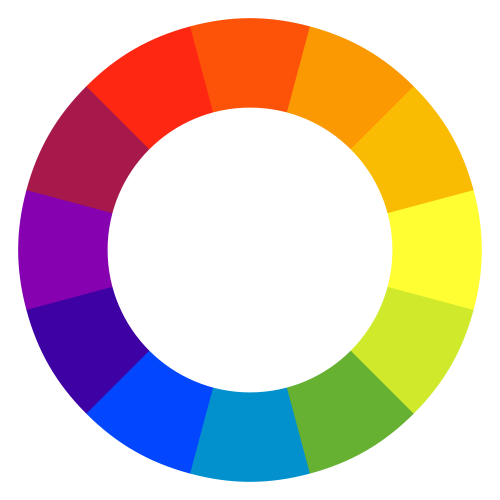 Let’s look at a color wheel and study the relationship between primary colors, secondary colors, and complementary colors. Red and blue and yellow are primary colors. If you mix these primary colors, you can make secondary colors. (Remember, the terms “primary” and “secondary” are arbitrary terms that are used to define the colors.) In any case, if you mix red and blue, you get violet. If you mix red and yellow, you get orange. If you mix blue and yellow, you get green. Combinations of primary and secondary colors are called complementary colors. For example, red and green, blue and orange, and yellow and violet are complementary colors. What did the Impressionists do that was different? First, at times the Impressionists would mix complementary colors together (red with green, blue with orange, yellow with violet) to create grays and darker tones. Second, the Impressionists would sometimes take primary and secondary colors in complementary color combinations (red and green, blue and orange, yellow and violet) and place them down in strokes right next to one another in dabs and would not smooth them together. As a result, these complementary colors would appear brighter and more energized. Also, many Impressionists would place primary colors, for example, blue and yellow, next to each other without mixing them on their canvas such that the colors would mix in one’s eye and one would see the secondary color green! If you can, go to a museum and take a look at a painting by an Impressionist. You will see that at a distance the colors appear to vibrate and smooth out and mix in your eyes, not on the canvas. One invention that influenced the new style of Impressionism was the collapsible metal-tube of paint, which enabled artists to paint out-of-doors. Earlier, oil paint could only be stored and carried in tiny pouches made from pigs’ bladders. Artists would pierce the skin of the bladder and squeeze out the paint. The paint hardened quickly with exposure to the air and was messy to use. And the bladders would often explode! Storing oil paint in a pig’s bladder also meant that it was difficult to have every color needed on hand at one time. With the invention of the collapsible metal-tube of paint, everything changed. Even though Impressionists liked to paint out-of-doors, when they did take their work into the studio, they often chose light-filled studios with pale-colored walls, which contributed to a lighter color pallet in their work. Indeed, Impressionists often added white to lighten tone and sometimes left the white ground of a canvas exposed. Key to the new style of Impressionism, however, were the many new pigments that were being developed at the time. Many of these new pigments were in a range of hues (yellow, green, red, orange and blue) and were brighter than the traditional pigments, which contributed to a more intense color pallet in the work of the Impressionists. What was so special about the new pigments? Besides giving Impressionists a range of new colors to paint with, the new pigments had inherent physical properties such as opaqueness and strong tinting that were key. How so? Light is unable to pass through opaque color, and strong tinting means only a little pigment is needed to create saturated color. 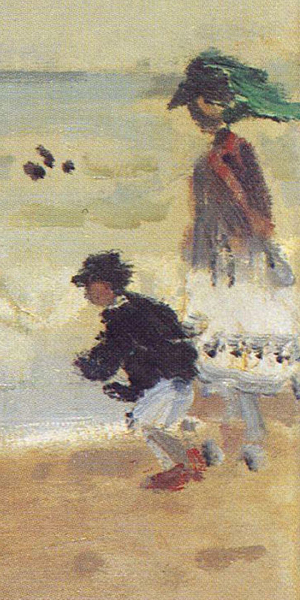 Thus, the Impressionists were able to create solid effects with a quicker and more direct technique and without the elaborate layering technique that academic artists engaged in. In addition, Impressionists didn’t wait for each successive application of paint to dry. Wet paint was placed into wet paint, which produced softer edges. Other inventions that made it possible for Monet and the Impressionists to paint out-of-doors and helped them develop the new style were the folding easel and smaller canvases. Thus, with Impressionism, no longer do we have artists laboriously mixing paint and applying glazes of color layer-by-layer in the studio. We have artists who were able to go outdoors with their collapsible metal-tubes of pre-made paint and folding easels and smaller canvases, study how changing atmospheric conditions affected the “impression” of objects, and convey the immediacy of these impressions in short, broken strokes in a whole array of bright, intense colors. Do you want to learn how the new style that Monet championed came to be called Impressionism? Early in his career, Monet used bright, pure color, often mixed with white to build up his forms. He favored blue and experimented by eliminating black from his pallet, even in shadows. Like his colleagues, he did not make detailed preliminary drawings of his works. Instead, while searching for subjects to paint, he used rough sketches as preliminary notes. These open-air sketches or studies at first would form the basis of studio compositions, but soon they would become finished works in their own right. At first, Monet’s work was criticized as being too true to nature. Critics expected art to improve upon nature. They wanted artists to strip nature of its chaos and roughness and show nature as timeless and perfect. Despite this criticism, Monet and his fellow artists continued to go on painting trips to the forests outside Paris and practice open-air painting there. Such open-air landscape paintings were admired for their truth to nature, but some were criticized for being only “an impression.” At one independent exhibition of these landscape paintings, one critic called Monet and his colleagues “Impressionists” and described Monet’s painting called Impression, Sunrise as less finished than wallpaper. This is how this new style of painting came to be called Impressionism. In 1870, Monet spent his honeymoon with his new wife Camille on the Normandy coast in Trouville, France. His father had been against the union for some time and had cut off his allowance. At the time, Monet struggled and was poor. 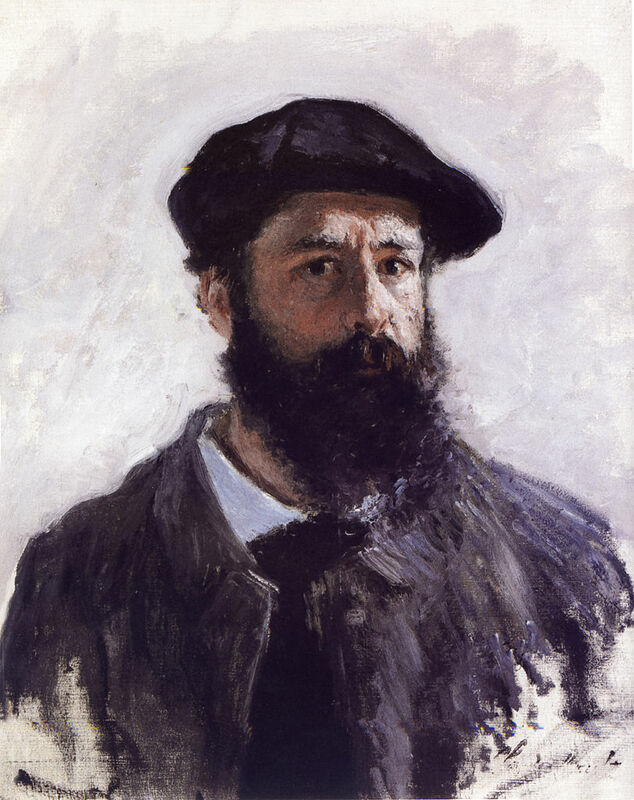 Monet claimed that he was so poor that at one point he even tried to drown himself. Another time, he slashed many canvases in an attempt to keep them from his creditors. He relied on the financial help of his fellow artists. Friends who were better off would bring Monet and Camille scraps of food and would buy Monet’s paintings from time-to-time. At Trouville Monet used small, portable canvases to paint rapidly on the spot. He painted vigorous, individual dashes of bright color to capture the fleeting impression of sunlight on water. Let’s take a close look at Monet’s canvas. It was painted on his honeymoon. 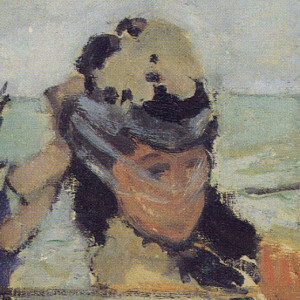 It is titled Camille on the Beach at Trouville. Monet’s work features Camille sitting on a beach chair by the shoreline. What can you tell me about the way Monet composed his work? First, some of Monet’s figures are stick figures. Describe the swimmers in the distance. Are they shown with just a few strokes of paint? Yes, they are. 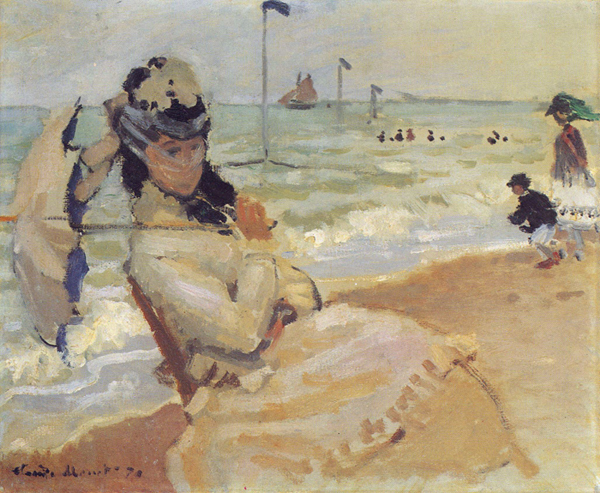 Second, the wooden beach chair on which Camille is sitting is an important part of the composition. Monet reduced it to a roughly painted diagonal line that links the foreground (the space immediately in front of us) with the background. How so? The diagonal line of Camille’s back opposes the diagonals of the oncoming waves and receding beach. Three poles recede into the distance on the diagonal too, which together with the diagonal of the shoreline, expand the space into the distance. Our eyes naturally follow these diagonals from the foreground into the middle ground and then into background, where there is a sailboat and a horizontal strip of sky. Third, there is a bold close-up of Camille. Describe Camille’s face. Is it clearly defined? No, there is none of the detail that one would expect with a portrait. There are practically no features on her face at all. You can barely see her face behind the gossamer blue and white veil that is protecting her from the sun and wind and sand. Does she even have a nose and mouth? What else can you tell me about the way Monet composed his work? First, there is little modeling of pigment from light to dark to suggest the domed shape of Camille’s parasol. Instead, Monet used blue to suggest the underside and sand-colored hues to suggest roundness. What about the outline of Camille’s dress? Is it crisp and clear or is it sketchy? It is sketchy. In addition, Camille’s dress is flat—so flat it looks two-dimensional. It appears to blend right into the sand! Second, Monet painted wet-in-wet. What does this mean? This means that Monet completed his painting in a single sitting. There was no time for each layer of oil paint to dry. Monet applied each color of paint next to, and over, another that was still wet. You may be interested to learn that when Monet painted this work, the wind blew sand onto the canvas. If you are lucky enough to see this work in person and you look carefully, perhaps you will see some sand embedded in the paint. Third, Monet dragged the color on his brush across the canvas. Can you see where Monet did this? Look at the waves lapping upon the shore. Do you see how the brushstroke of white paint that defines the wave on the right hand side of the canvas is dragged across the skirt of the woman standing there? To better understand how Impressionism differed from French academic painting, let’s compare Monet’s work with a late work by a well-known French academic artist who was one of the most famous French painters in his day—William-Adolphe Bouguereau (1825-1905). The work we will look at is Bouguereau’s A Childhood Idyll. In some ways it is a good example of French academic art. First, let’s determine what an idyll is. Do you know? An idyll is a poem, piece of literature or event of a rural and peaceful scene. Describe the scene. Two barefoot girls are relaxing out-of-doors, perhaps on a dune by a beach with grasses and shrubs. One girl is playing a flute. Her companion is contentedly listening to the music while leaning gently upon her friend’s leg. Similar to Monet’s work, we have an outdoor scene. But don’t be fooled. Bouguereau painted this work in his studio, not out-of-doors like Monet did. What elements of art did Bouguereau use in his work to give us an idyll? The girls’ hair and clothes seem soft and feathery. Also, Bouguereau painted the effect of haze by using less focus and dull, blue hues for distant objects to create the soft effect of cloudiness or humidity. Nature appears to be soft and inviting and has a timeless quality. The sunlight is diffused through the overcast sky and is even and plays across the scene in a gentle manner. There is none of Monet’s depiction of nature’s harsher qualities. Indeed, there is no unpleasant wind sending gusts of sand into the girls’ eyes or blowing their hair around madly. 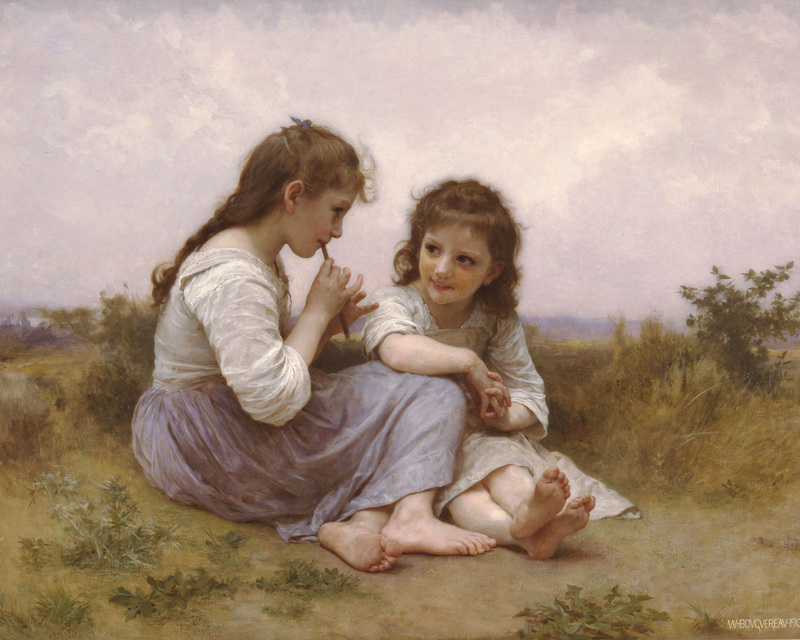 Bouguereau probably modeled the girls after the peasant children he met on his travels in the countryside. French academic artists liked to copy the art of ancient Greece and Rome. It may just be me, but the girls in this work appear to be lovely figures from long, long ago. Also, Bouguereau chose not to show the children in the latest fashions of the day but painted them wearing clothes that could perhaps belong to any century. This adds to the timeless quality in the work. This is exactly what many critics and collectors wanted artists to do—show nature and man as timeless and perfect. As a French academic artist, Bouguereau took the time to do research and sketch and plan out his composition. He drew his final composition on a piece of canvas, and when he was ready to paint, he painstakingly added one layer of color at a time, allowing each layer to dry before adding a new layer on top. His work is very detailed, but there is little indication of his brush on the canvas. The paint on his canvas is smooth and glossy and without any texture. One can see his brushstrokes only in a few spots: in the short, wispy brushstrokes in the shrubs, and in the big, fanned brushstrokes that make up the clouds. The soft, pastel colors in Bouguereau’s work are lighter and some of his lines are less defined and crisp as in many of his earlier works. Even so, many aspects in this late work continue to distinguish Bouguereau’s academic style from Impressionism. Try to find the differences. First, are the girls in Bouguereau’s work shown with just a few strokes of paint as the swimmers are in Monet’s work? No, the girls’ figures are fully modeled and are three-dimensional. Second, Camille’s dress looks two-dimensional and appears to blend into the sand. Do the girls’ dresses in Bouguereau’s work blend into the background? No, their dresses are clearly distinct from the background. Third, did Monet create clearly defined outlines in his work? No, Monet did not create any outlines at all. 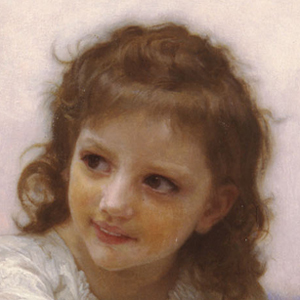 In contrast, Bouguereau created dark outlines for the girls’ heads that are clearly defined. Fourth, Camille was placed close-up in Monet’s composition but with none of the detail that one would expect with a portrait. Look at the faces of the girls in Bouguereau’s painting. You can see the details. The details look perfect. When details in a work of art look this way, we call art idealized. Many critics liked that Bouguereau idealized nature and man and showed them as perfect and timeless. Finally, Bouguereau placed the girls in the center of his composition as if they are on a stage, which creates a sense of calm and balance. In contrast, Monet placed Camille off-center, giving his composition a sense of energy and action. Bouguereau’s style attracted many admirers. Today, many find his technical skill impressive and continue to love the beauty of his work, but others find his subjects old-fashioned compared to works by Monet and fellow Impressionists. Perhaps what many continue to find interesting about Monet’s work is that it is beautiful and raw and immediate and keeps the viewer off guard. Is Monet’s work a portrait of Camille? Is it a seascape? Also, look at Camille’s parasol, the flag on top of the pole in the center, and the woman on the right hand side of the canvas. These forms are nearly cut off, aren’t they? It may just be me, but all these elements make me feel as if I am sitting right next to Camille on the beach amidst all the chaos of nature. I can hear the waves crashing upon the shore, the merry cheers of the children, the young at heart splashing in the water, the flags flapping against the poles. What is interesting to me is that Monet has successfully portrayed the true nature of a windy day at the beach. If I close my eyes, I can almost feel the wind, my hair flying in all directions and the sand blowing against my face. Monet was successful, wasn’t he? He created a scene that is fleeting and immediate and fresh! Would you like to see Camille on the Beach at Trouville and A Childhood Idyll in person? All you have to do is visit Yale University Art Gallery in New Haven, Connecticut to see Camille on the Beach at Trouville. A Childhood Idyll is at the Denver Art Museum in Denver, Colorado. If you’re lucky enough to visit either museum, I’m sure someone there will be happy to point you in the right direction. Or perhaps you can arrange a tour for you and your family and friends. Whether you visit these museums on your own or have a tour with a docent, it will be well worth your time to see Camille on the Beach at Trouville and A Childhood Idyll!